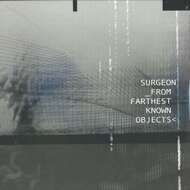 Having emerged onto the techno scene back in 94' with the Detroit led Surgeon EP (legend has it these recordings were composed when he was locked in the downstairs toilet come studio at fellow Brummie Mick Harris of Napalm Death/Scorn's house) and released on long time associates Karl O'Connor aka Regis and Peter Sutton aka Female's Downwards imprint. The release of this 12" marked Surgeon real name Anthony Child instantly as a name to check, by mixing at times harsh and abrasive sounds from the Jeff Mills school of smash the f**k out of the speakers with a sharp but singular UK industrial sound that built upon the foundations of groups like Throbbing Gristle and artists such as Fad Gadget, Surgeon made the first steps into the history of UK industrial post-punk led techno. This first EP led to an array of projects including landmark albums for Tresor, the breakbeat techno collaboration British Murder Boys that was Whitehouse reimagined for the dancefloor and more recently collaborations with Blawan as Trade and the surprise live project with Lady Stardust.